Family, friends and a host of co-workers who have worked alongside Jim Conner through the past half-century, have been pleased to learn recently that the launch ramp at Grider Hill Marina and Resort has been named in honor of his years of working at the local marina. Jim, and his wife Joyce, are shown in front of the new sign near the launch ramp that will forever remind visitors to Grider Hill Marina of his long dedication to his job at the marina and his friendship with the many co-workers during his 53 years of working at the marina, as well as the friendship with the thousands of customers he came to know through the years. 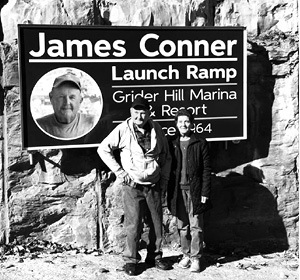 Conner recently retired from his job at Grider Hill, but with the naming of the launch ramp in his honor, his presence at the marina will always be acknowledged.